Jean Clemens: Dorothy, I've tried my whole life to make my father happy, but I've never been as successful as you were this afternoon. STRONG EFFORTS BRING ELOQUENT EFFECT. 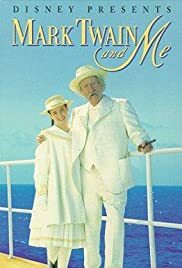 Disney produced one of its best works of the 1990s with this charming film based upon memoirs of novelist Dorothy Quick that describe her close relationship with Samuel Clemens, initially published in 1981 as "Enchantment", reprinted as "Mark Twain And Me" in 1999, depicting events from 1907, when the two met while returning to the United States from England aboard the S.S. Minnetonka, until Twain's passing in 1910, with both book and film replete with scenes of surpassing delight and melancholy. Eleven-year-old Dorothy, played well in her film debut by Amy Stewart, was often a guest, along with her widowed mother (Fiona Reid) of the renowned humourist at his New York City town home in Tuxedo Park as well as at his estate in Redding, Connecticut, and from this faithful cinematic adaptation it is readily perceived that Clemens was not merely a bitter pessimist during his last days as is stated by some critics, but rather a warm and frequently jocose individual who cherished his various surrogate granddaughters, of whom Dorothy was foremost in his affections. Jason Robards, in scrupulous makeup created by Kevin Haney, is first-class as Mark Twain, and the piece is directed in his customary sensitively nuanced manner by Daniel Petrie who guides a predominantly Canadian cast and crew with most footage being shot in Canada, as Petrie emphasizes those details that gratify not only the eye (and ear) in every scene, but one's sense of artistic integrity in the bargain. Each player is in surpassing form, abetted by Petrie's craft and superior post-production contributions, with standout execution from Talia Shire as a tragically disregarded Clemens daughter and R. H. Thomsen in a thornily reticent role as Albert Paine, biographer, secretary and sometime amanuensis of the creator of Huckleberry Finn and Tom Sawyer. In the last analysis, those mentioned details constitute the greatest strength of this delightful production with each scene offering savours, aided by an ample budget, but even more through the efforts of cinematographer Francois Protor and editor Paul LaMastra, and additionally a pungent score composed by Laurence Rosenthal, lavish set ( William Beeton) and art (Jacques Bradette) design, assiduously accurate and lavish costumes of Linda Kemp and invaluable post-production sound mixing by both Elius Caruso and David Lee - all under the sterling leadership of the veteran director.